We all use devices and are sometimes unaware of the dangers out there that could infiltrate our information. Apple offers two back to back laid security walls: iCloud Keychain and a Security Code. These are set in place to work with strict protocols to only allow entry authorization and give access to only its approved user and his devices. Your iPhone carries your usernames, passwords, credit card information, embarrassing attempts what you think qualifies as decent selfies and so forth. It’s vital information which, if resting on the wrong hands, could spell doom for you. 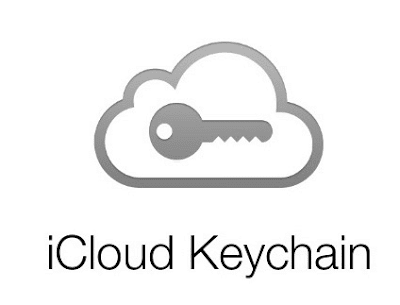 I’ll fill you in on why your iCloud Keychain and its Security Code are things to take seriously and be thankful for. We will learn what these are, how to use them, how authentication & approval works to ensure access to devices and thus enjoy solid all out protection. This article is meant for a wider audience about the vulnerabilities and precautions one must be wary of on a daily basis. Imagine you’re at your local KFC, in the toilet helping your four year old work the mighty potty. A spider makes it entry down the wall and you two are hysterical, both shrieking like, well, two four olds. Some quick jerky movements and your kid’s cute little shoe falls into the toilet, and as you try to pick it up before it goes all Titanic on you, your iPhone drops in, from your breast pocket, as well. Ask yourself, what stings the most right now. The shoe, which you don’t even think is cute and frankly looks sort of recycled from ocean waste, or the iPhone carrying all your digital data. Also, which scream is the loudest, the spider scare or the iPhone drop? Think about it. The iCloud Keychain is much like Heimdall from Thor, a gatekeeper of sorts. The iCloud Keychain works round the clock to save your usernames and passwords from your Safari web browser, saved pages, bookmarks, credit card data, Wi-Fi information and all other data stored by apple and you work with on your Apple products running the iOS7.0.3, its later versions, OS Maverick 10.9 and later versions – across all Apple platforms. It’s all synced. You saved a Katy Perry music video on your Macbook, it’ll show up on your iPhone browser. It’s a lot of information, isn’t it? You could be a Prime Minister on your way to office with sensitive information on your devices: iPhone, iPad and MacBook Pro, or a research associate, regardless, loss of data or unauthorized access to it could ruin your life. Of course, there’s a key and system at place to keep it intact. Your code simply is the 4 or 6 digit code you have set up to gain access to your device, i.e., all essential information about YOU on your Apple product. If you had a wonderful conversation with a carpenter you found online on Messenger and saved his information only on that app, you’ll find if you use your iPad to access your email, Derek carpenter cheap will appear on all apps, saved, including Contacts, synced across all ios devices. Pretty handy, right? How Does the Security Code Come Into Play? You can watch this video out there to show you how it holds everything together in your devices. Let’s work with real life scenarios to understand this phenomenon without getting bogged down by technical jargon. We will learn how these two security measures work side by side, become valued as irreplaceable and cannot function entirely too well without the other. Okay, now your buddy from college recently got married and is looking to invite the in-laws for Thanksgiving. Only problem is that his house isn’t exactly what you would call pleasant. Mould, termite and the odd talks about asbestos are plaguing the marriage, so he thought a pleasant dinner with the family could bring him and his missus together. She’s no dummy, a dinner isn’t enough. A renovation is needed. Now you’re at the office, your new iMac laid in front of you and on the left there’s a picture of your kid, wearing that ugly shoe, is framed and aimed right at your eyes, reminding you of the bathroom incident. Your landline rings and you pick up to answer your friend asking if you know any good carpenter for a reasonable budget. Of course, Derek is your guy but you had his information saved on your home computer and you left your iPhone at home. How do you find Derek? Now this iMac was an additional device. 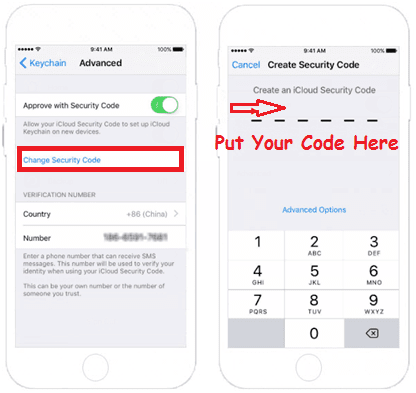 What you need to add it to the list of already approved devices under the protection of your Keychain is to use the iCloud Security Code. This is a new device in your office. One code sets you apart and is unique to you. Once through, this opens up all the information linked by the chain. This is what your code is all about. You need to enter your previously determined code into the iMac and voila! Your new office computer is now in sync and you now have access to other Keychain related activities including the matter at hand, finding Derek! This means Derek is now synced and can easily be found on all your social media accounts, including Myspace, yeah, that’s a bummer. You then share Derek’s contact details and hope he is to your friend’s liking otherwise you’ll get judged for having a poor taste in carpenters. I mean this after the shoe debacle is not good news. Nobody will think you’re fit - - for anything! But be sure you don’t mistakenly type in the wrong code too many times otherwise your access to Keychain will be denied and you’ll need to set up again. I know Derek’s your buddy but let’s not get too excited. Click Settings > [your name] > iCloud. If you're using iOS 10.2 or earlier, click Settings > iCloud. Click Keychain and slide to switch on iCloud Keychain. Read the onscreen instructions and follow it. Select Apple () menu > System Preferences, then tap iCloud. Chose Keychain. If you wish to, you are allowed to place a passcode to unlock your screen after sleep or after the screen saver commences. And go through the onscreen instructions and follow it. For a different way to learn, this could make this slightly interesting. 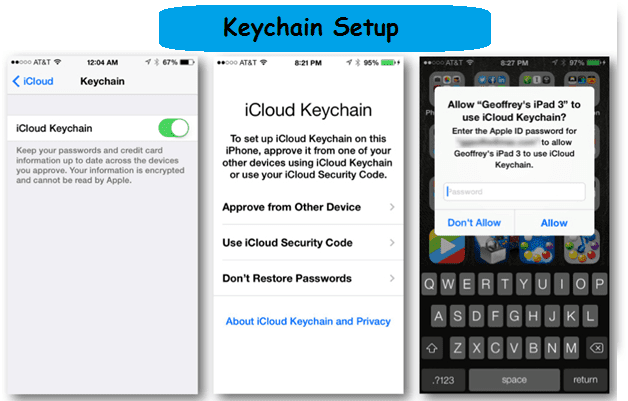 But if fail to access any device that has your iCloud Keychain, you have to go for a fully different process to reset icloud keychain. Let's have a look at that! What we’ve come to understand thus far is that it’s a doubled layered system. The code on one hand which grants one stage of access and then you’ve got the Boss level entry guarded by the Keychain. While all these systems of verification are running your identity through their servers, your information stored on devices and web platforms are all interconnected and synced and updated each time you make a change. It’s the kind of reassuring thing you’d like to keep at the back of your mind before going to sleep, especially so if you operate out of multiple devices. Am I Still Doing It Right? But we do have nightmares, don’t we? Think of the ways this almost air tight system that could very well beat 007 and fail you. Easy: sloppiness on your part. Apple can provide security for you as long as you are willing to take it all the way. Have you made sure that you set up Keychain on all the devices you want to use? Yeah, do that. Once done, you’ll see it seamlessly update itself and be on sync with the other devices. The beta thing would be to ignore the step to set up a Security Code and only set up the Keychain since it’s what’s holding the information. However, loss of the chain would mean loss forever – unless you’ve got the code which ensures successful recovery of your digital existence which, in today’s world almost appropriately and sadly, is a huge portion of who we are. The alpha and non-dumb thing would be to have the code and chain both in place. Don’t risk it, apply this dual level security coverage just to be on the safe side. For those Googling other password management tools and apps, keep in mind, that your basics are met, at least, and these two discussed so far are advanced enough for the most of us. A lot of us have heard of leaks and hacks of our iCloud information and are hesitant to leave our data and authentication information on it. 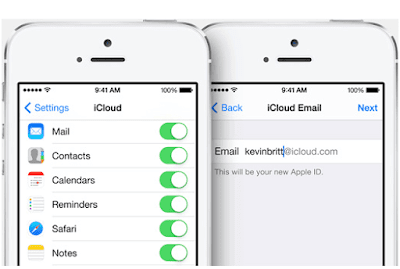 There are ways to ensure your iCloud Keychain information remains ONLY on your device and other approved ones and NOT on Apple servers. In this instant, however, you need to forego setting up the Security Code. (FYI: without it, there will be zero chances to recover your Keychain should you lose it, but I guess, there are still a few Thelma & Louises out there who feel they want to risk it). Find and click Advanced Options to choose either: A Random Security Code, or, Don’t Create Security Code. If you’re still paranoid and want to make any and all previously stored information on their servers might be at risk and requires removal, then use the Advanced Options tab to turn off Security Code and Keychain off of each approved device. That way all its information remain solely on your hands and not THEIR’S. Perhaps watching this can make it clearer. In the event you’re locked out, Apple offers simple step-by-step instructions, on their support pages regarding successful authentication, further set up and approval of devices, to regain control of your life since it all seems to be at a standstill until all’s okay with your iPhone so freaking Derek can call to show you his kitchen table designs for your friend while your kid chews on that shoe. Dammit, Derek! The average John and Jane out there don’t have the time nor interest in going full research mode on their devices. They take too much time off our hands anyway. People don’t joke around when they mean it’s like an added limb to our body. People talk about phantom vibrations and sometimes being able to tell if they’ve got notifications on their screen without looking. This, almost voodoo telepathy we seem to have, a ridiculous bond with our devices, sometimes getting more of our time than the humans around us, is getting to a point where we have to draw a line. Yet, that doesn’t mean choosing ignorance. Vigilance is required to make sure your devices are messed with or messed up.